The piece group, The Lonesome Days, are Colorado natives based out of Denver, Colorado. They are known for their high energy, heartfelt songs and powerful vocals. They will also be joined by Bridget Law, another Colorado native. Bridget Law is a virtuoso violinist. 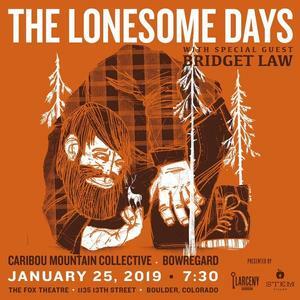 They will be joined by special guests Caribou Mountain Collective and Bowregard.